The FCS2 Starter set requires a stage adapter for precise positioning. 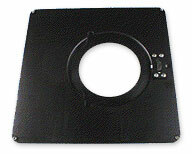 Due to the diversity of microscope stages, a stage adapter cannot be included with the FCS2 starter kit. Select a stage adapter for your scope from the drawings below. When ordering please indicate the brand of microscope and the manufacturer’s stage identification number with the description and the corresponding Bioptechs part number. Custom designs are available upon special order.